Traveling with pets can be a rewarding experience. Take the time to plan everything out to make sure that your furry friend is going to be comfortable and safe throughout your trip. Whether you’re travelling by land or sky, the first step is to find a pet-friendly hotel that specializes in extended stays. Once you’ve got that covered, here are tips to enjoy your vacation with your pet. After booking your holiday, it’s important to understand your hotel’s policies on pets. For instance, if you’re traveling to downtown Edmonton, some hotels only allow certain breeds or small animals. At Canterra, we welcome pets of all sizes and species for an additional nightly fee. If you’re staying at Canterra, you can take your pet for exercise and play time at Railtown Park which is right next door. You can also find other off-leash parks in Edmonton here. Don’t forget to look into other pet-friendly attractions in the area, such as markets, shops and restaurants. If by chance you get separated from your pet, displaying this information right on their collar will ensure that you two are reunited as soon as possible. There will be times when you’ll have to leave your pet alone in the hotel room while you’re shopping, having dinner or visiting places that are not pet-friendly. Before stepping out, make sure your pet has plenty of food and water to last until you return. If you’ll be leaving your furry friend for an extended period of time, look for nearby pet groomers or daycares, so they can be pampered while they wait. If you prepare ahead of time, traveling with pets can be truly enjoyable. Plan your activities well in advance to ensure both you and your furry friend have a great time. 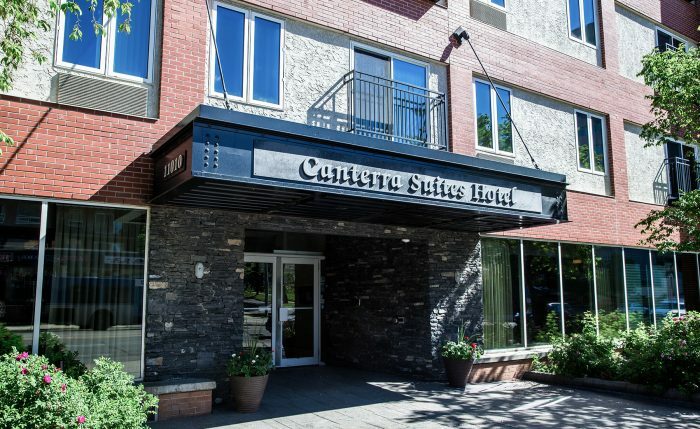 To learn more about our pet policies or extended-stay services, give us a call at 780 421 1212 or email us at info@canterrasuites.com.